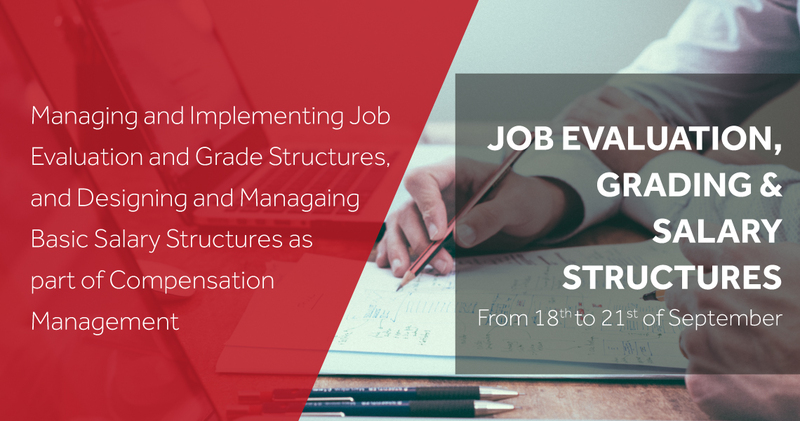 This course will provide you with sound knowledge of job evaluation skills and provide an understanding of how job evaluation fits into the broader context of human resources management, and to provide practical skills in the application of job evaluation systems. Most employers want to ensure that they can "attract, retain and motivate" the best employees and teams, and this three-day course will cover the key areas in job evaluation tools and techniques and best-practice processes for evaluating jobs and placing them accurately into your overall grade structure. This course will explore the different types of job evaluation systems that are used in the Middle East today and give you a detailed familiarization with the concept of job evaluation and an appreciation of the most commonly used best-practice approaches. Increase your business performance and employee effectiveness through implementing compensation and reward systems that attract, retain and motivate staff. Align your basic salary structures and grades and compensation and reward systems to your business objectives and human resources strategy. Develop solutions for your own compensation and reward issues and challenges based upon practical case studies and interactive course and clinic discussions. Opportunities for networking in the breaks with your fellow course delegates and course tutor to discuss practical issues that will help you in your workplace.